With eco-credentials this high, what’s not to like? The Sustainability Centre sprang to life in 1998, in a former naval communications base in the South Downs. with a vision to educate people about economical and environmental reform. Nestled among 55 acres of woodland and natural chalk downs, the campsite lies on the route of the spectacular South Downs Way. 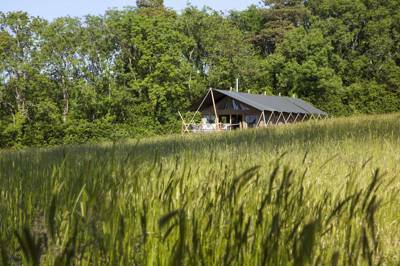 The tipis and yurt are located in the main campsite, divided by bays of brambles and trees. The tipis smell earthy inside, enhancing the site’s natural concept. The yurts, Rose and Olive, are furnished with rugs and cushions, a table and chairs, a log-burning stove and two double futon beds, or double and single. In the bays you’ll find four individual camping bays, Forget-Me-Not, Willow, Hazel and Yew – surrounded by nothing but trees, it really is a magical setting. Whichever canvas space you choose to spend the night in, you’ll find the cost of your stay economical, which is always a bonus. 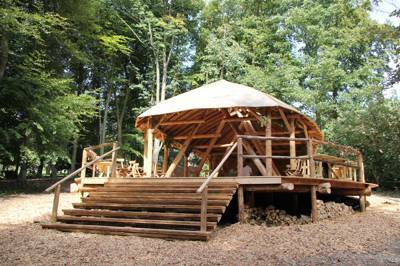 The Earthworks Trust, which owns and runs the centre, is independent and funded in part through the income generated by its campsite, yurt, and two tipis. Various onsite paying courses (in the likes of permaculture, natural building, forest management, food foraging, herbal first aid and willow basket making) are scheduled throughout the year and conducted in a rather grand outdoor eco-classroom. Course participants can learn how to draw on conservation craft and natural remedies that could aid a healthy and sustainable future. Our camping field is in a peaceful open space, surrounded by trees and creating a welcoming natural environment for individuals, families, group expeditions, companies and even wedding parties. We have a main campground with a fire pit as well as private camping bays. We encourage guests to enjoy nature and the natural environment, and we hope you will find it peaceful and relaxing nestled within our 55 acre woodland site. We promote the values of our wider organisation The Sustainability Centre. There are recycling containers by the car-park and we limit vehicle access to the campground so nature is allowed to flourish. Our facilities include a straw bale building that houses solar showers and a washing up area, a compost loo, running water and a clay pizza oven. Vegetarian food can be purchased during the day at the onsite Beech Cafe. 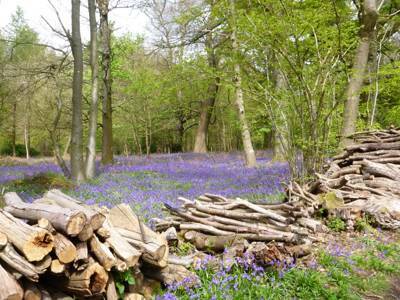 We supply wood from our woodlands or from a small local producer. For larger events, celebrations or groups the whole campground may be rented for a fixed exclusive price, in accordance with our values on low-impact events. The accommodation team, Dan, Sam & Pete look forward to meeting you! Main site pitches for up to six occupants. More private pitches for up to six and one secluded four person pitch. Campfires allowed in 2 fire pits, and there’s a communal covered BBQ (wood/charcoal £5). Space for 40 tents; 2 tipis (sleeping 6/10 – bit of a squeeze; no standing room); yurt (sleeping 10) has 2 single beds (bring the rest of the bedding). Comfy eco-lodge for hire. Three solar showers, 2 sinks, and 3 compost loos. Onsite Beech Café serves organic, fair trade vegetarian meals (open Thurs–Sun). Recycling bins. Plenty of walks; the nearest starts in Petersfield and winds up in Exton. Treat yourself to Michelin-starred modern British fare at JSW (01730 262030), a 17th-century former coaching inn in Petersfield. Camping: Adults £10–£12; children (2-17yrs) £5.50–£7; exclusive use £840 - £1220. Yurts: Adult £35; children (2-17yrs) £12.50. Dogs allowed in tents £1 each, Olive and Rose yurts £10 each. Firewood £6. Take the Clanfield exit off the A3 and follow the brown sustainability signs. The centre is 2 miles from the Rising Sun Pub, on the left. Train to Petersfield, 8 miles away, and the nearest bus stop is 2 miles away in East Meon.